How to request reproductions of archival materials from the Archives of American Art. First, locate the desired collection, oral history, or item record on the Archives of American Art website using search and browse. Next, click the "Request Reproduction" link. For collections with detailed descriptions, select the desired folders using the checkboxes first and then click the "Request Reproduction" link. Finally, you will be sent to the Archives' Research Request System, Aeon (link opens in a new window) where your request will be processed. First time users will be asked to register in Aeon. To learn more about Aeon or to register, please visit the Research Request System, Aeon (link opens in a new window). There is a limit of 10 items per order if new scanning is required. Please note: high-resolution images may not exist for all digitized collections. If you require more than 10 new scans, you may place another order after your initial order is complete. If you have already received a digital item from the Archives of American Art and would like to reuse it, please submit a request through the research request system and note that you are interested in reusing the item. 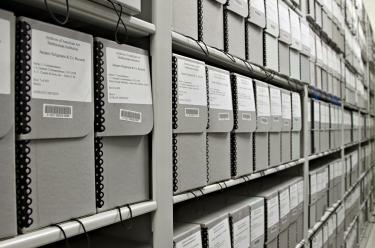 In order to protect both you and the Archives, we must have a reproduction agreement in place. All reuse requests are subject to a $25.00 administrative fee. Up to 5 free images per year for academic research and non-published papers, including graduate thesis or dissertation. Valid credentials and details of the paper or project must be provided. We reserve the right to review all requests of this nature to determine whether or not they fit the criteria. Not for reproduction or duplication of any kind. Please note the audio-visual material must be duplicated in its entirety. All orders are processed in the order they are received. After submitting your order, you will receive a quote within two business days, with your reproduction agreement and invoicing information to follow shortly thereafter. Rush services are available for most purposes, but are subject to staff availability and the current status of our queue. Please note that rush services are not available for television broadcasts and film/documentary uses. Please note in your Aeon request by what date order fulfillment is needed. A staff member will notify you if we are able to complete your order within the desired time period. Documents, photographs, art work, microfilm, recordings, and transcripts owned by the Archives of American Art may be protected by copyright, trademark, or a related interest not owned by the Archives. It is the sole responsibility of the applicant to determine whether any such rights exist, and to obtain necessary permission for use. How to Investigate the Copyright Status of a Work (PDF), from the U.S. Copyright Office. Get Adobe Reader (opens in a new window). The Smithsonian Institution has an agreement with Showtime Networks, Inc, which requires that all requests for material to be used in film and television productions go through the Smithsonian film committee for approval. You will need to submit an application, which can be found online at https://www.si.edu/film-request-form (opens in a new window). Your application will be automatically sent to the film committee staff. While many questions are structured towards filming in and at Smithsonian facilities, please do try to answer the questions to the best of your ability. Before we can supply any materials for use in film or television productions, we must receive your approval from the film committee, the signed contract that the Smithsonian Office of Contracting will prepare for you, and payment for the digital files. Requests subject to film committee approval can take several weeks to a few months to process, so please build that into your production schedule. Note: All requests for status updates should be directed to the Smithsonian Office of Public Affairs at 202-633-2400. Questions about an order? Please contact our rights and reproductions coordinator at AAARepros@si.edu.